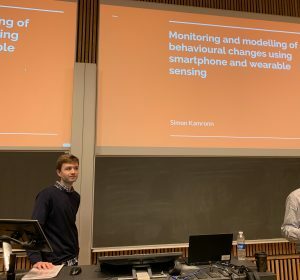 Today my PhD student Simon Kamronn successfully defended his PhD thesis ”Monitoring and modelling of behavioral changes using smartphone and wearable sensing”. Congratulations, Simon! 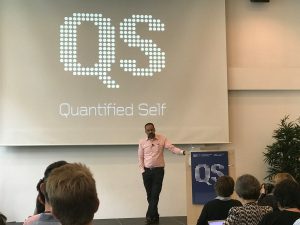 I participated in the QS2018 conference Sept 22-23 in Portland – two very intense days as (again!) I had committed to do too many different talks and sessions during the conference. This included a breakout session on subjective experience tracking and a how-to session on building self-tracking instrumentation. In addition I did a personal show and tell talk and was invited to the panel in the closing plenary session. In particular I enjoyed the opening of the QS18 conference by Allen Neuringer, professor of psychology saying “I have waited 50 years to be here”. Had the opportunity to participate in SAA 2017 – the 5th biennial conference of the society for ambulatory assessment and present our work on Instrumenting ecological momentary assessment with a wearable smartbutton as part of a session on Methods and Protocols. 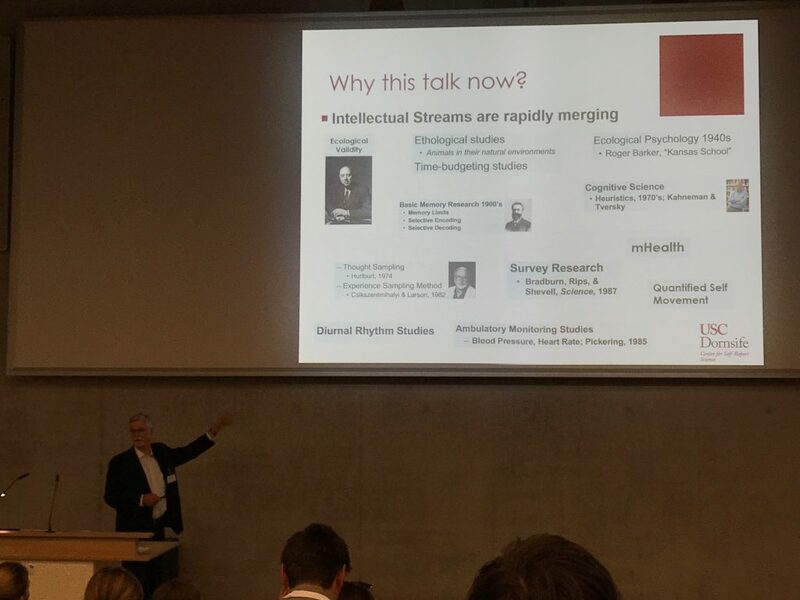 Moreover I had the opportunity to attend the keynote by Arthur Stone on “Challenges remaining for the field of real-time data capture”, including his shout out to the “Quantified Self Movement”, as he phrased it. During the Q&A I asked him to elaborate on the role of QS from his perspective, to which he responded: I think it’s really interesting that people are becoming so interested in monitoring themselves and get feedback about themselves. To me it seems like again maybe we should think about what they are doing and what they are saying and talk to them. And perhaps talk about the hypothesis generation, because I don’t see them doing the kind of stricter scientific research that we need to do in order to confirm the associations. But I think, I mean it’s great that people are doing this and are interested in this. It’s a little worrisome that the big corporations are getting into this – I mean maybe it’s worrisome, maybe it’s great. I’m not sure. 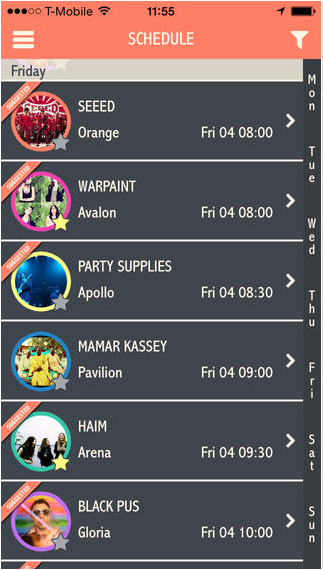 Something is happening now and I don’t know quite how this is all going to turn out. 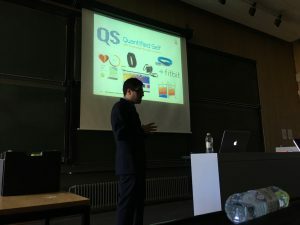 I was invited to give a keynote at the Quantified Self Institute at Hanze University of Applied Science. 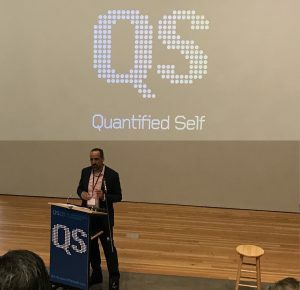 My talk was entitled (Repurposing) self-tracking tools to obtain insights, where I discussed some of the practices observed among the experienced self-trackers in the Quantified Self Community over the years. 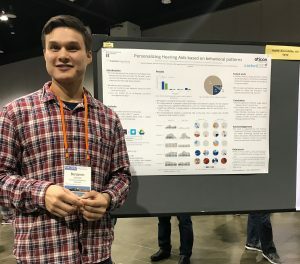 My PhD student Benjamin Johansen presented his work on “Personalized Hearing Aids based on behavioral patterns” at the CHI2017 conference in Denver. There is a poster and a short paper. 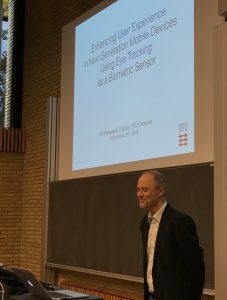 Today my PhD student Per Bækgaard successfully defended his PhD thesis ”Enhancing User Experience in Next Generation Mobile Devices Using Eye Tracking as a Biometric Sensor”. Congratulations, Per! Today my PhD student Andrea Cuttone successfully defended his PhD thesis “Data Mining and Visualization of Large Human Behavior Data Sets”. Congratulations, Andrea! 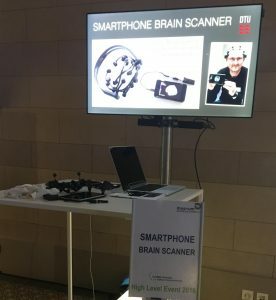 We got invited to showcase the work on the smartphone brain scanner as part of a EURO Tech meeting in Bruxelles. Yet again we got a lot of enthusiastic response on our work. Benjamin Johansen joins the lab as a PhD student in the Cognitive Systems Section at DTU Compute under my supervision and co-supervised by Michael Kai Petersen. Benjamin will work on personalization and enhancement of the user experience in the hearing aid fitting process. The project is part of an ongoing research collaboration with Oticon and is in part funded by The Oticon Foundation. 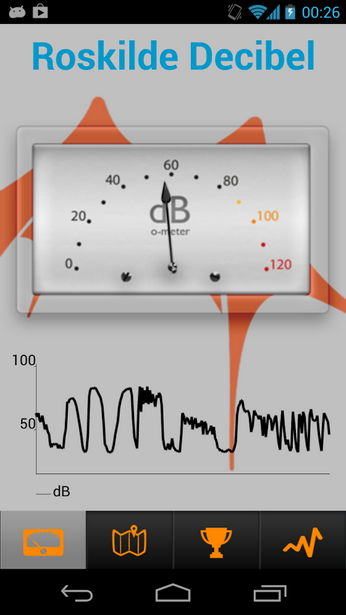 The working title of the PhD project is Personalizing hearing care and enhancing user experience by adapting devices to the changing mobile context. Welcome, Benjamin! 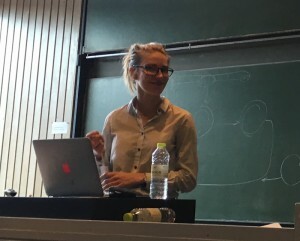 Today my PhD student Camilla B.F. Jensen successfully defended her PhD thesis “Design of Cognitive Interfaces for Personal Informatics Feedback”. Congratulations, Camilla! 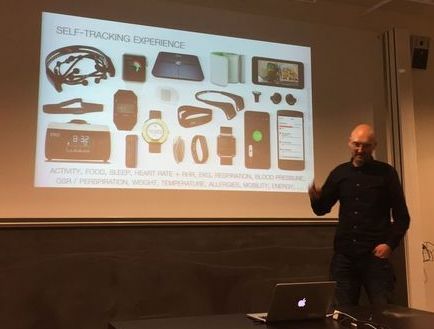 I co-organized a workshop at UbiComp’15 on Quantified Self titled: New Frontiers of Quantified Self: Finding new ways for engaging users in collecting and using personal data. 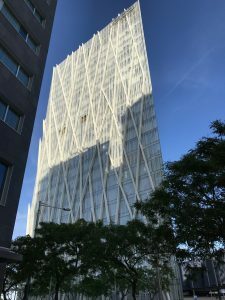 The proceedings from the workshop is available at the ACM Digital Library. I got invited to talk about Man Machine Interaction at the new established IDA Future Talks. In my talk I touched upon the exponential development of machines and how computers have moved closer and onto/into our bodies to monitor our behavior and interactions, exemplified by the phenomenon quantified self. Being a future talk I specifically addressed the potential of this technology in future improvements in health and well-being. Although most of the terminology used at the IDA Future Talks was in English the talks were in Danish. 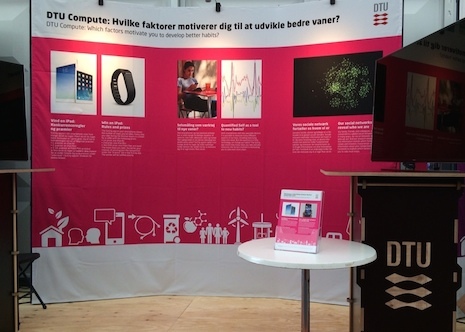 The title of My talk was Human with Machine (in Danish: Menneske med maskine). Simon Due Kamronn joins the lab as a PhD student in the Cognitive Systems Section at DTU Compute under my supervision and co-supervised by Lars Kai Hansen. Simon will work on 24/7 monitoring of physical activity and energy expenditure in everyday life activities using smartphones and wearable sensors. The project is part of an ongoing research project in collaboration with University of Copenhagen in part funded by TrygFonden. The working title of the PhD project is Monitoring and Modeling of Behavioural Changes using Smartphone and Wearable Sensing. Welcome, Simon! At the 2014 ACM International Joint Conference on Pervasive and Ubiquitous Computing (UbiComp 2014) we had the 5th international workshop on Personal Informatics. This year the workshop was framed as the “Disasters in Personal Informatics: The Unpublished Stories of Failure and Lessons Learned”. The idea was to stimulate a discussion on the challenges involved in conducting research in personal informatics. 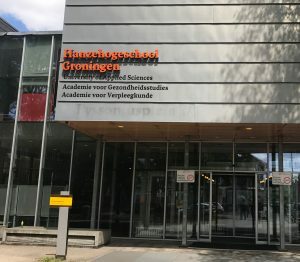 Nine interesting papers were discussed in three themes as part of the workshop program: Personal Informatics in Life, Data Collection and Quality, and Engagement in Longitudinal Studies. My PhD student Andrea Cuttone and I presented our work: “The Long Tail Issue in Large Scale Deployment of Personal Informatics” discussing issues in carrying out Personal Informatics research as part of our large-scale SensibleDTU study. 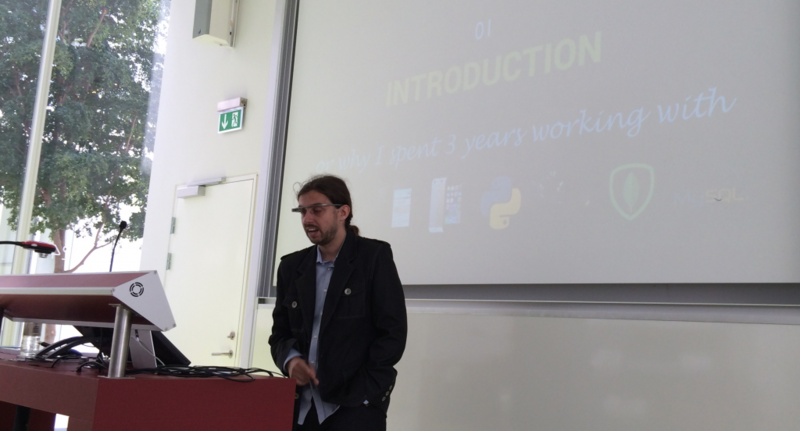 Today my PhD student Arek Stopczynski successfully defended his PhD thesis ‘Mobile Phones as Cognitive Systems‘. Congratulations, Arek! 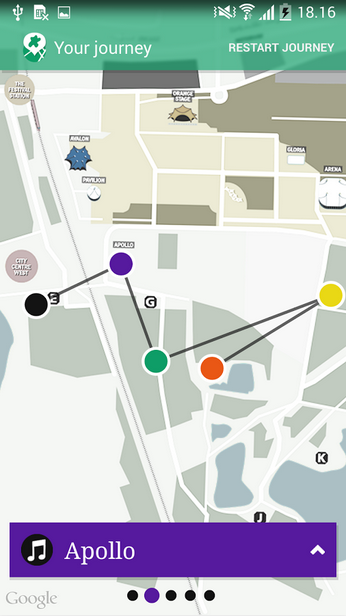 This week we are showcasing our research in Quantified Self and Network Science at the EuroScience Open Forum 2014 (ESOF) Science in the City festival. Our tagline is: Which factors motivate you to take more steps? With smartphones and new wearable devices it is possible to measure many different aspects of our lives, including exercising, sleep and mood. But the question is if this technology can change our habits? 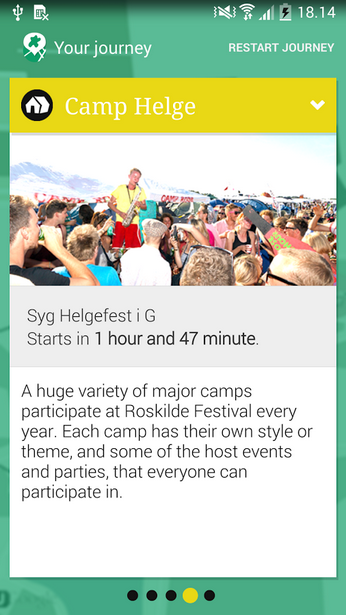 Our team from DTU Compute uses Science in the City as the foundation for a scientific study – and we use the official SciCity app to do this. We have included a step counter feature in the app and use the app to study the factors that motivate to take more steps. 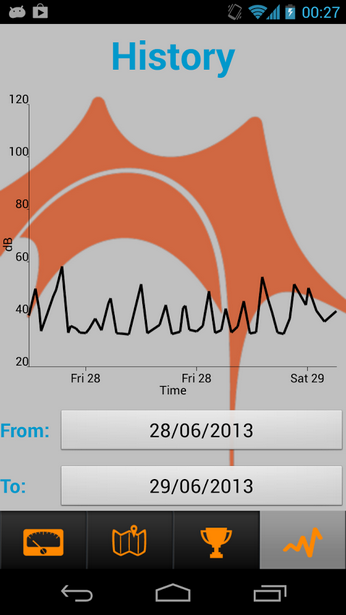 Our study is based on the two exciting scientific fields: Quantified Self and Network Science. Quantified Self addressing how self-monitoring (for instance apps on smartphones or wearable gadgets) influence our self-perception and Network Science studying the mathematics that describes structure and dynamics in our social networks. Via family, friends, and colleagues, we’re connected to a global social network. In many ways, our social networks show who we are. And our research shows that this information reveals which fundamental values and interests characterize us. 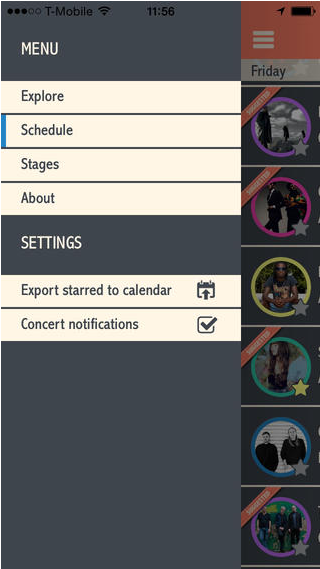 We use information about the connections on, e.g. Facebook to explore which factors motivate the user to take more steps.